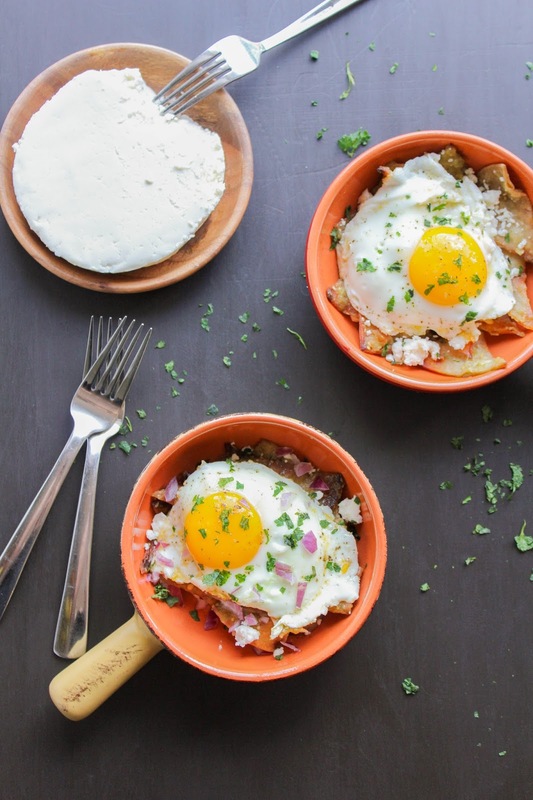 For those of you that like savory breakfast dishes, these chilaquiles are for you! 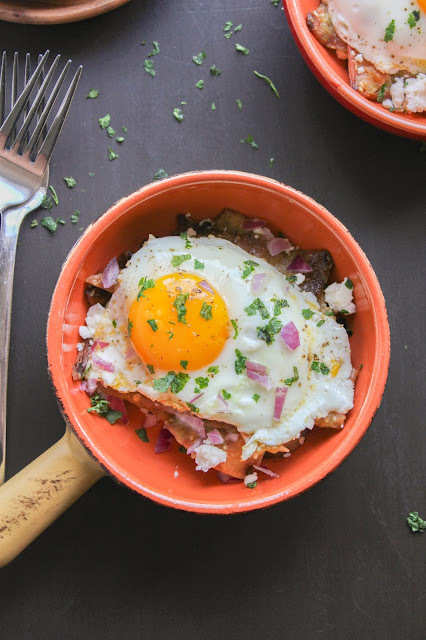 This hearty and delicious Mexican dish combines homemade tortilla chips, salsa verde, cheese, eggs and fun toppings to make one mouthwatering breakfast or brunch! You all know how much I love breakfast. Especially weekend breakfast, when I have more time to make something special for my family. It's also a known fact that I'm obsessed with Mexican food. I literally could eat it every night for dinner. Enchiladas, burritos, nachos, I love it all! With that being said, I decided to combine two of my favorite things into one delicious dish. 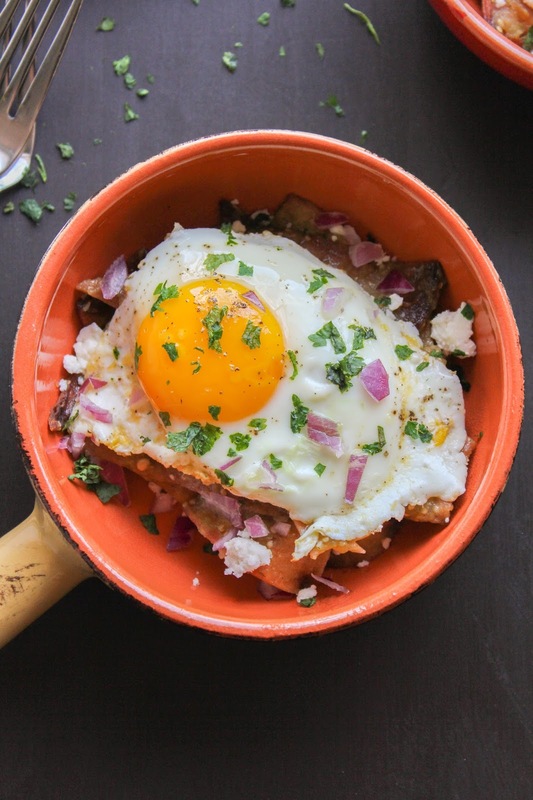 A Mexican breakfast, you ask? Yes my friends. 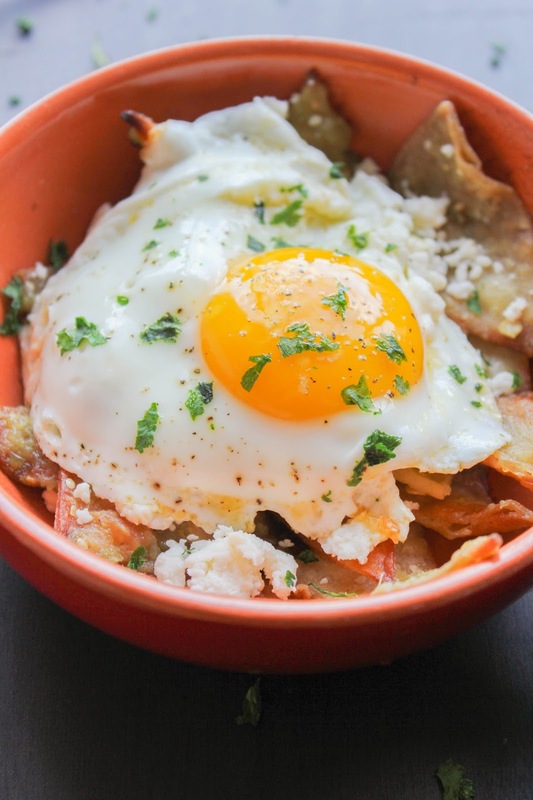 An amazing Mexican breakfast made with homemade tortilla chips, salsa verde, cheese, and eggs. And of course some other toppings, but you get where this is going. 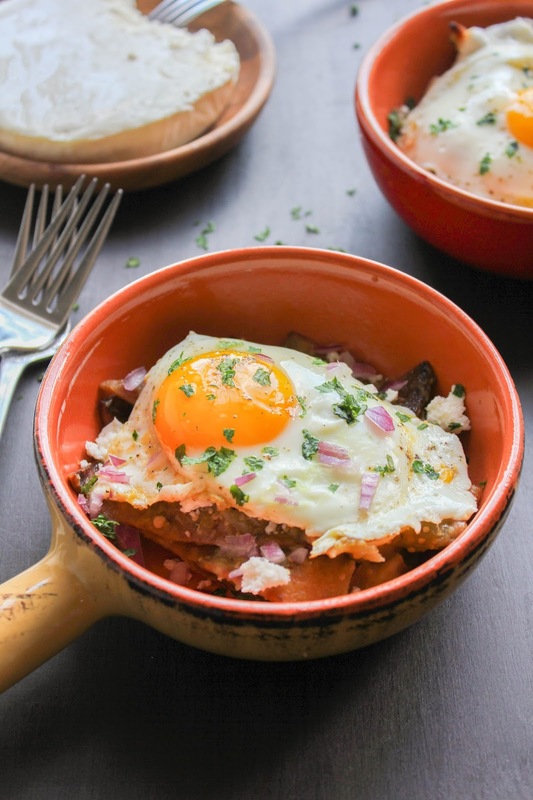 These Breakfast Chiliquiles with Eggs are so flavorful, it's like a party in your mouth. I mean it! They are seriously THAT good. And they're quite simple to make, too! You can use jarred salsa verde, or homemade, whatever is easiest for you. I have a salsa verde recipe that I love to make and store in the frig for dishes like this, or enchiladas, or even just to go along with tortilla chips. Either way, this dish is delish! To a large skillet, add about 1/4 inch of vegetable oil and turn the heat to medium high. When the oil is hot, add the tortillas in batches and fry until golden brown. Using a spider, or a slotted metal spoon, remove the tortillas to a cooling rack set over a baking sheet so that the oil can drip off. Sprinkle with salt. Strain off any tortilla bits from the pan, then add the salsa. Let it cook until it's nice and hot, then add all of the fried tortillas to the pan. Carefully stir the tortillas into the sauce, making sure they are all well coated. Let them cook for a few minutes, then remove from the heat and keep warm. Cook the eggs, either fried or sunny side up. In four individual serving bowls, place a good amount of the tortillas and salsa verde. Top the tortillas with a heavy sprinkle of the queso fresco cheese, then top with an egg. Sprinkle each dish with a bit of the chopped onion and cilantro, then serve. I'm honored to be a Milk Means More Ambassador and I thank them for sponsoring this post! I was compensated for developing a "Let's Do Brunch" recipe, however all opinions, as always, are my own.